Those who are 13 years of age or older, are physically healthy, and do not smoke are the best candidates for rhinoplasty. Florida rhinoplasty specialists Dr. Samson have performed this procedure multiple times and advise their prospective patients to view their rhinoplasty before and after pictures before scheduling a consultation. When considering rhinoplasty in Florida, it is important to go to a plastic surgeon you can trust. Dr. Samson have experience with ethnic nose surgery, including Asian rhinoplasty and African American rhinoplasty. For those who have already had rhinoplasty surgery and are unhappy with the results, Dr. Samson can perform revision rhinoplasty. 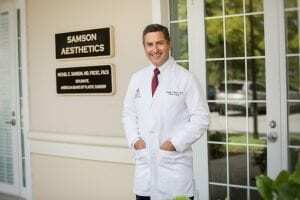 Florida plastic surgeons Dr. Samson will listen to your specific goals with nose surgery during an initial consultation to ensure you achieve the results you desire. Either intravenous sedation or general anesthesia will be administered for your comfort at the time of surgery. You will receive either open rhinoplasty surgery or closed rhinoplasty surgery depending on your particular needs and preferences. With a closed rhinoplasty procedure, the incisions are hidden inside the nose. An open rhinoplasty procedure involves an incision across the columella (the narrow strip of tissue that separates the nostrils). Open nose surgery allows your surgeon to pull back the skin and tissue to more easily alter the underlying structure of the nose. Depending on the changes to be made, the minimally invasive closed nose surgery can often be performed to achieve the desired results. Cartilage from other areas of the body can often be used to augment the nose. Cartilage is most often taken from the septum, but can also be grafted from the ear and rarely, the ribs. Bumps in the nasal bone structure can be altered to provide a smoother profile. If the nostril size is to be decreased, an incision will be made at the crease where the nostril meets the face. The excess skin will be trimmed away, and scars will be hidden in the natural creases of the face. Once the procedure is complete, a nasal splint will be applied outside of your nose, and tubes or packing will likely be placed inside your nose. Bandages will be placed on the outside of the nose to protect it from infection. You will be given specific instructions to follow during your rhinoplasty recovery regarding how to care for the surgical site, which medications to take or apply, and when to follow up with your surgeon. You should expect swelling and bruising for about two weeks. Rhinoplasty recovery time varies among patients, but most achieve final results after three months. How much does rhinoplasty cost? The total cost of rhinoplasty surgery varies depending on multiple factors including the extent of the procedure performed, cost of anesthesia, cost of the surgical facility, and the cost of any medical tests or prescriptions you may need. Dr. Samson can give you an accurate cost estimate for your specific needs during a one-on-one consultation. In order to receive a more complete facial transformation, many patients opt to have another cosmetic procedure performed at the same time as their nose surgery, such as a face lift or brow lift. If you are interested in these or other cosmetic surgery procedures, schedule a consultation with Dr. Samson today at 386-756-9400 or fill out our contact form.